As Sustainability Coordinator and Waste Management Consultant for schools, I am always counting and weighing garbage bags, mostly under the watchful eyes of head custodians that are highly skeptical of being asked to institute a “recycling program”. Sometimes with the help of the students, sometimes without. The general notion in schools is that when there is a blue bin somewhere, then there is a recycling program. Upon being asked how much commingled they are actually pulling out of the building to be recycled, I am often met with a lengthy explanation on why the material is so contaminated that they have to discard it as trash. The prevalence is still that ” It is all garbage to me” and ” I don’t have time to recycle”. That is where We Future Cycle, a non profit organization specialized on large scale sustainability programs comes in. The mere fact that I come in and count and weigh the garbage puts a value on garbage, which was not there before. Custodial staff usually does not think of the cost associated with garbage, but being told just how much their school generates creates already an awareness. 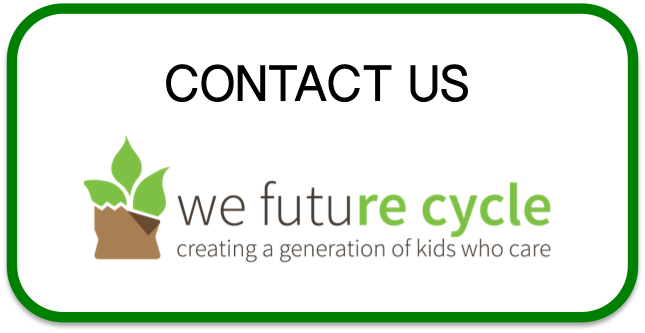 Schools being supported by We Future Cycle are usually audited before any recycling program component is implemented, and then after each component comes on line, and then periodically to make sure things are still on tracks. We have seen dramatic reductions from 277 lbs from lunch alone down to 3.5 lbs and 187 lbs from night clean down to 21 lbs. Showing reduction results from other schools with similar number of students is first met with high degree of skepticism, but once they see me standing on a scale, holding a bulging dripping back of garbage to weigh it, they know, that School Waste Audits show that change is very possible. Check out how these Trinity Elementary Students are carefully pasting their waste free leaf to the tree. Liam Sparano (K, Ms Hawkins class) has received already 6 leaves ” I eat healthy snacks to get energy to grow big and strong like Superman”. Trinity Elementary School students are proudly pasting paper leaves with their names to the Waste Free Tree that is taking up most of the wall in the front lobby. This Waste Free Tree symbolizes the change Trinity students are making in terms of snack packaging. Only students whose mid morning snack is completely waste free will earn a leaf and the opportunity to paste it to the tree. Students that are waste free and also super healthy will be able to earn a bonus leaf. And ….. this tree is sprouting leaves like crazy! We Future Cycle, a non profit organization specialized in bringing large scale sustainability programs to schools was hired to turn New Rochelle on a path toward sustainability. 4 presenters did class by class presentations to over 1000 students, helping them make the connection that snacks that are healthy for their body are often also healthy for the Earth as they come naturally unpackaged. Even kindergarten students, when presented with a picture of the packaging waste of classroom snack knew immediately that most of that food belonged into the category of junk food. When asked if that food was healthy for their body, they all enthusiastically replied “no”. They listed the commonly known reasons on why not to eat junk food, even the littlest ones knew the connection to obesity, diabetes and dental decay, amazing. Tanya Kadaru has received 6 leaves “My parents give me fruits and vegetables for snacks. They want me to stay healthy and get a lot of sleep so I can learn”. Teachers are reporting a decrease in plastic baggies and more reusable containers. More students are bringing in water in thermoses to drink and skipping the juice boxes. Trinity Elementary School is a shining example of how we can create a generation of kids that care through environmental education, and how it changes communities as well. White Plains Schools Also Recycles Soft Plastics….because they can! White Plains School District food service staff have been fabulous team players from the get-go in adopting the We Future Cycle lunchroom recycling program. We Future Cycle launched the recycling program at Church St, Ridgeway and Post Rd Elementary schools and the kitchen staff has been incredibly supportive and engaging. All participating schools reduced garbage by a whopping 95-98% and the kitchens went down to a office-size trash bin with just a few used gloves and some dirty soft plastics, that is it! However, what really makes these food service workers stand out is their willingness to go beyond ….just because they can! The kitchen is the only place in the building where clean soft plastic is collected and then eventually brought to the grocery store to be part of plastic bag recycling. Plastic bags, bread bags, and other soft plastics are used to make composite wood, which is a mixture of sawdust and HDPE. As plastic bags are only recycled through the local grocery store and cannot go with the municipal commingled pick up, most kitchens are not willing to take on the task of sorting them out and then dropping them off at the grocery store on their own time. White Plains kitchens said they can and they will. And so every week, sometimes even twice per week, one of these wonderful ladies drops of a bulging bag of clean, dry soft plastics for recycling. Way to go, what an example of going beyond…..
Changing the culture of a school district from “throw-away” to ” sustainable” is very challenging. Consider the sheer number of players in the system. However, New Rochelle City School District has embarked on that journey, understanding that educating a child includes also environmental and social literacy. And also understanding that this is a long term, capital improvement project that will pay out on many levels, some tangible, some intangible. Making a school district sustainable calls for changes in many systems and New Rochelle has hired We Future Cycle as principal consultant to move the initiative forward. Executive Director Anna Giordano is no stranger to New Rochelle school lunchrooms as she started the recycling program right here, in the school of her kids. Those were different times though, as the former central administration was less than supportive and many barriers needed to be worn down before real change could take place. However, as steady drip even hollows the stone, New Rochelle School District is now embracing sustainability with overwhelming energy. All elementary schools are fully source separated and have reduced their lunchroom garbage by 95% from the lunchroom and a good 50% from the building. Step by step, obstacles are identified and systems rearranged to allow for proper streaming of materials. Students are trained on a per class basis, informational material went home to parents, custodians came to professional development training sessions, classroom monitors and aides were trained to support learning and the building logistics were set up and are maintained. Bringing a recycling program to a school district is like driving a car. The journey cannot be done by just putting the engine in drive. We Future Cycle is happy to help the district reaching its destination of sustainable schools filled with a generation of kids that care. Can you imagine a 600+ student elementary school reducing its overall daily garbage to a total of just 27 lbs! Well, that is the reality at Post Road Elementary in White Plains. We Future Cycle implemented the lunchroom portion of the program in February and reduced the garbage from 277 lbs daily to just 5 lbs for breakfast and lunch combined. The second step was tackling the classrooms and the building in general. Signage and bins went into place and under the leadership of head custodian Rob Dell’Orletta the night clean crew kept the classroom materials sorted and bathroom paper towels sorted so they can be streamed into recycling and composting. Post Rd school only had 3 bags of trash, practically without any recyclable material mixed in, weighing a total of 21.5 lbs. That. Is. All! Out of a school with over 600 students. Amazing. That is less then 1% of the nation’s average of 4.5 lbs per person per day. Seriously….Way to go. Congratulations to the entire Post Road Team on an amazing job.